Team Bunny Whaler is sailing a 17' Boston Whaler Harpoon. 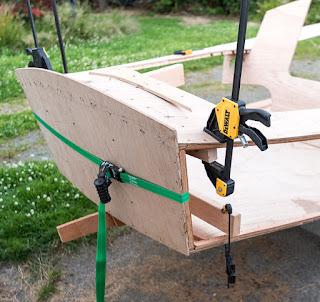 Can't Anchor Us wends its cantankerous way in a 16' Swampscott Dory. Coastal Express moves along in a 16' Mirror Dinghy. 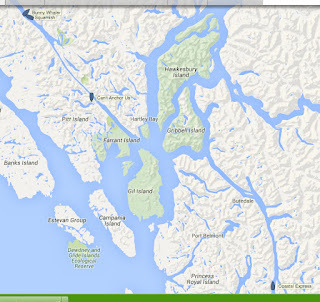 Squamish meanders northward in a 20' Y6M. The fastest monohull under 20' in the Race, Team Excellent Adventure with a 17' Montgomery, was the 20th boat overall to finish this year, completing the course in 16 days, 2 hours, 15 minutes (12th in 2015 at 18 days, 22 hours, 52 minutes). I am building Kingsfold with the 2017 Race in mind. This means that I am looking for ways to decrease weight and increase performance, and safety. 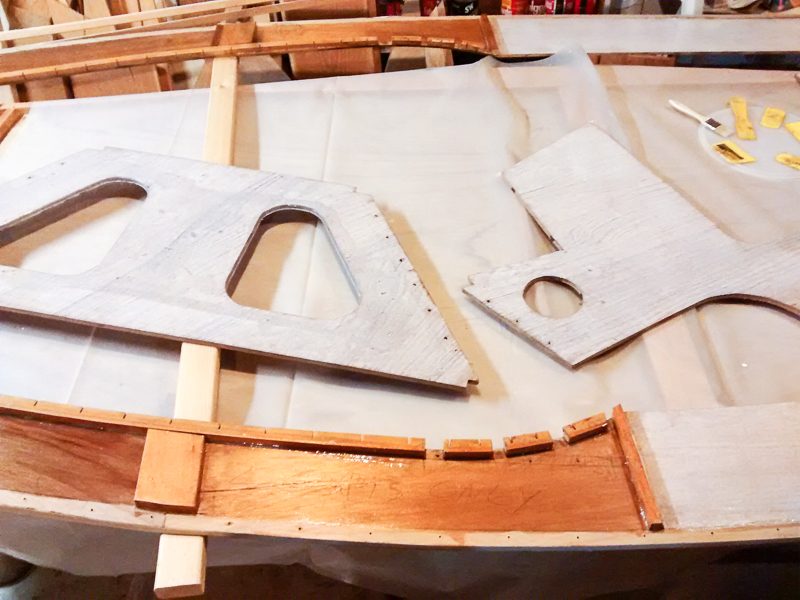 I plan to install 2" of flotation under the entire deck surface, and 4" at the transom, and forward bulkhead. 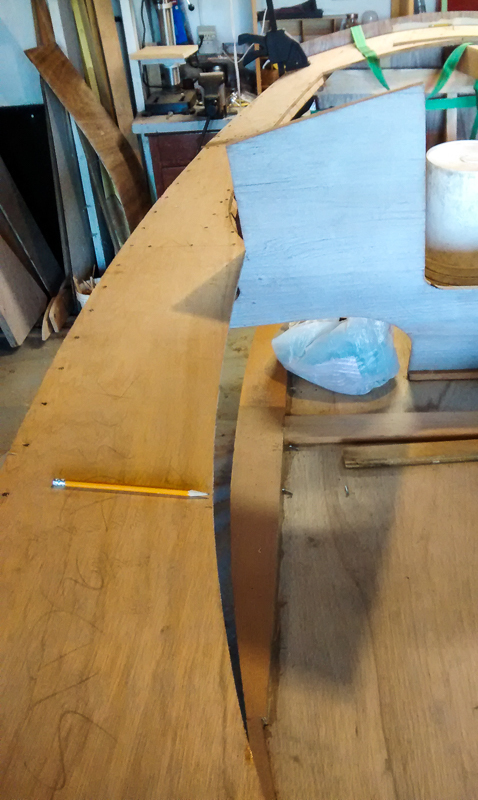 Additionally, I will be making this modification, designed by Paul Riccelli, to the stock keel and rudder. [With] the revised profile, skeg and sectional shapes, you'll crunch any and all Weekenders you run across, especially upwind. 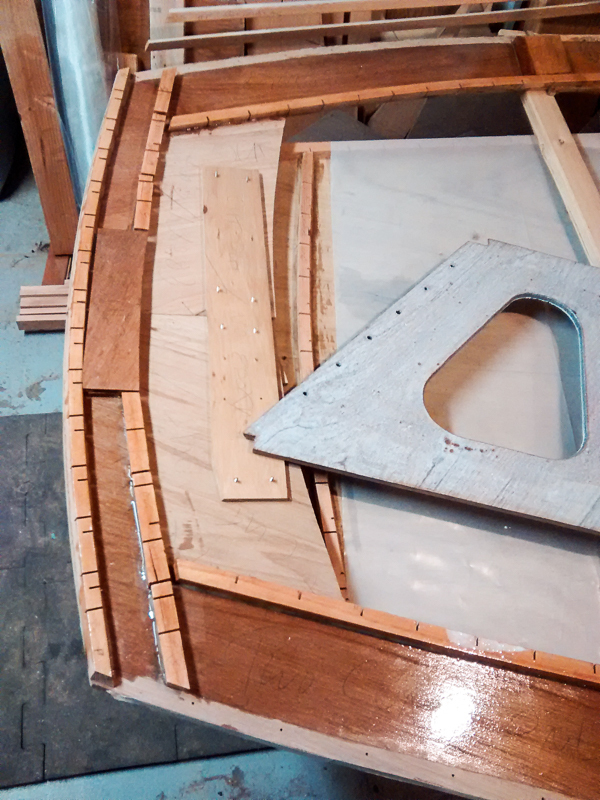 About 20 years ago, we took a couple of common daysailors and fitted one with a full length, traditional yacht keel. 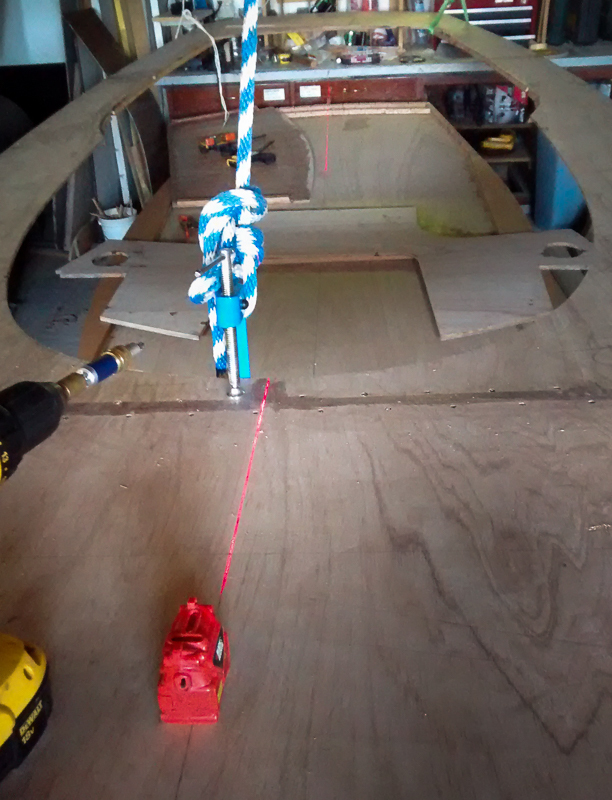 Next we cut back the forefoot, then moved the back of the keel forward so the rudder would be under the boat. Eventually we ended up with a modern fin keel and a spade rudder. 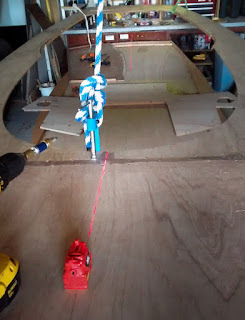 The unaltered centerboard sloop was able to beat the full keel version, but as soon as the full keel was cut to what is known as a "3/4's" keel (much like what I've drawn for the Weekender) the modified boat easily took over and started to point higher, had less leeward skid, could hold on in stronger wind strengths, etc. 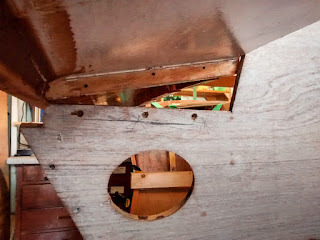 As I build, I am also looking for a team member who is an experienced sailor that is up for the adventure. Interested? Contact me. Is it just me, or is there a problem here? 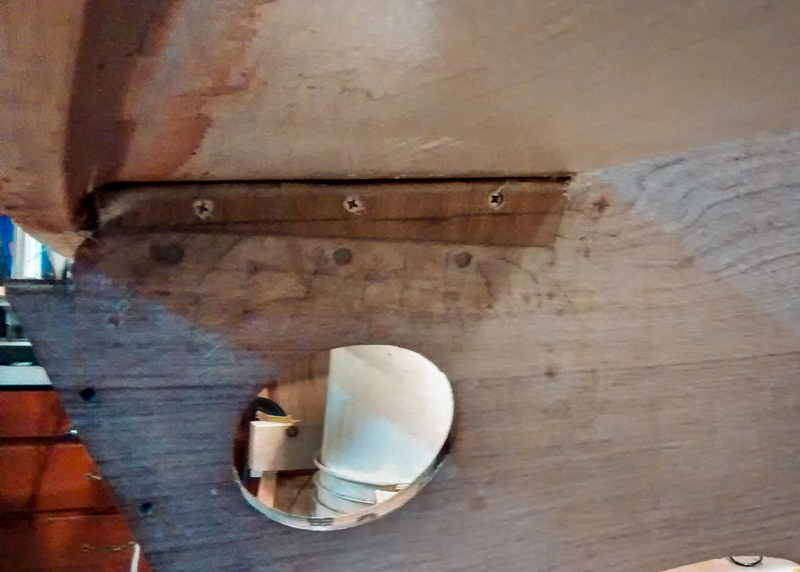 With the deck screwed to the stem in the front, and the transom in the back, I screwed the forward bulkhead in place. 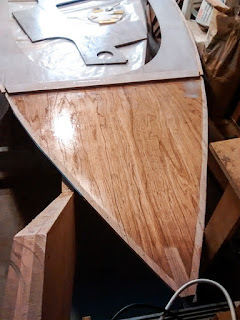 When I attached the deck sides to the main bulkhead, I was concerned by what I would describe as a severe twist in the deck surface transitioning from the strong curve of the aft deck as it moves forward to the flat of the sides of the cabin bulkhead in the middle of the boat. My solution was to lengthen the transition from curve to flat, extending it beyond this bulkhead towards the forward bulkhead. I added a piece like this below on both sides. 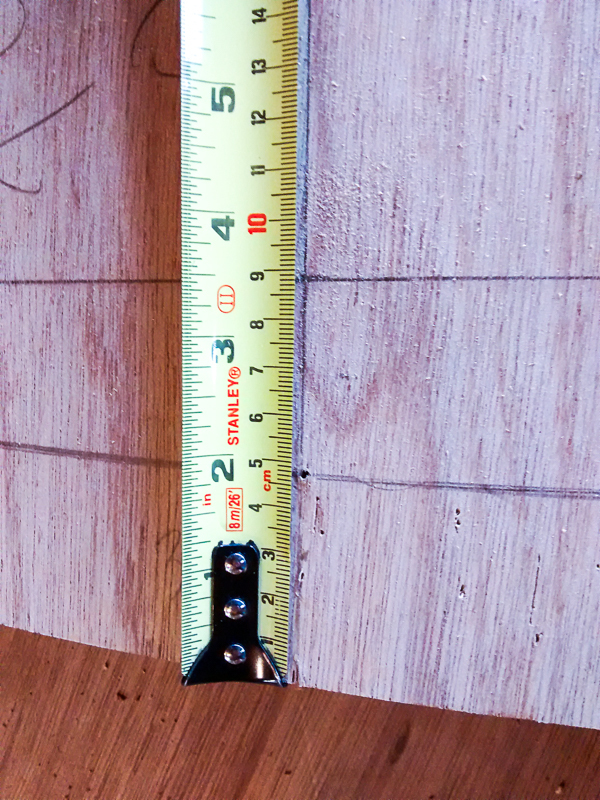 It is 1-1/2" high on the inside and 0-3/4" on the outside. I lapped some fiberglass over the top like a horse's saddle, extending the bottom edge an inch or so past the bottom seam and the inside end. 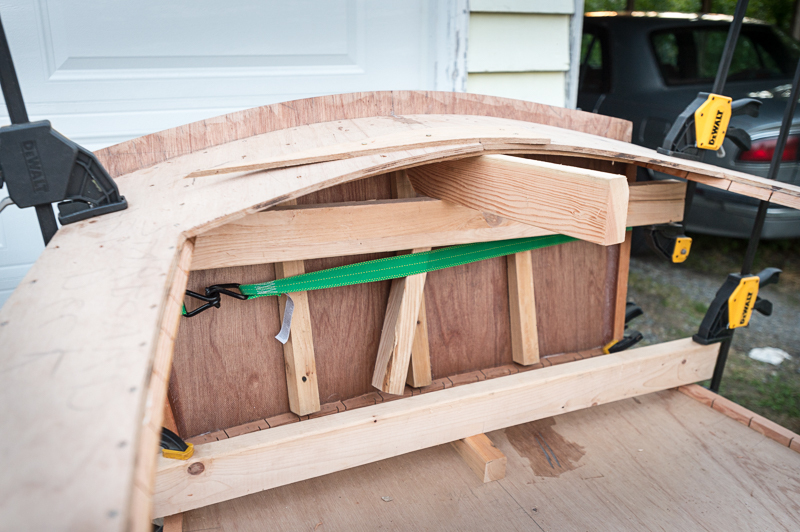 The curves of the deck's aft end and transom are significant. 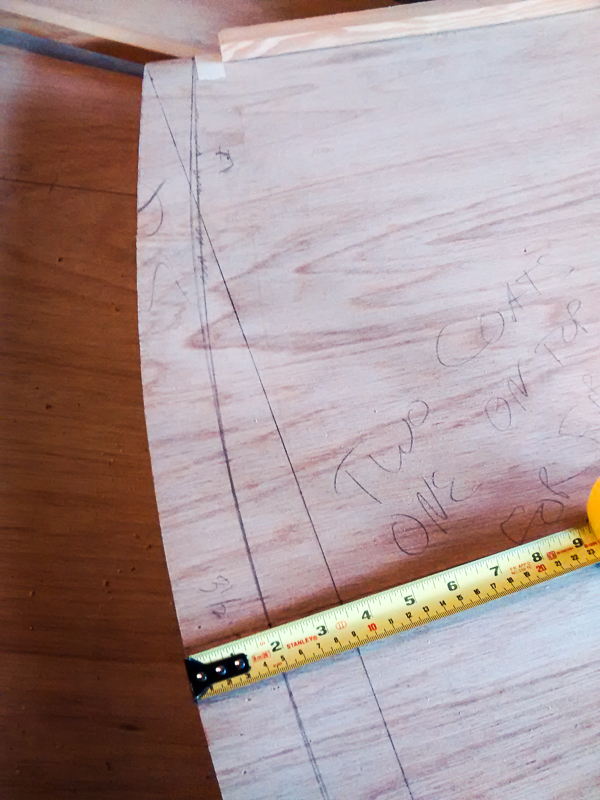 My marine plywood is quite stiff. I only have me to hold the parts together and drill in the screws. 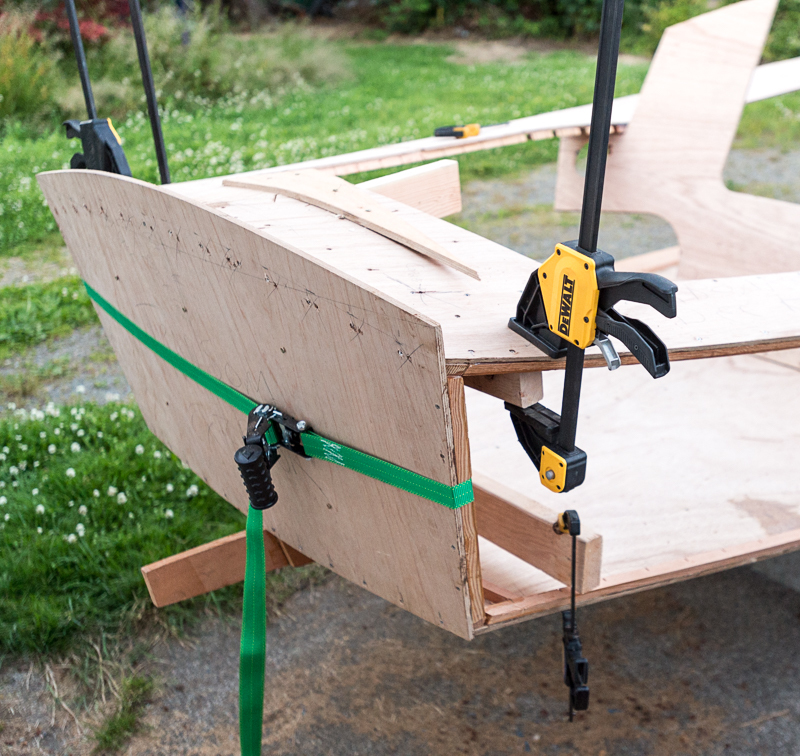 During a visit with Barry Pyeat, Weekender builder and a formerly active member of byyb.org, he gave me this idea. 1. Measure the depth of your curve, 3-1/2" for example. 2. Find a board, such as the 2"x4" under the deck here, that is the needed depth. 3. Clamp the ends of the surface to be bent to another 2"x as shown in the photo above. 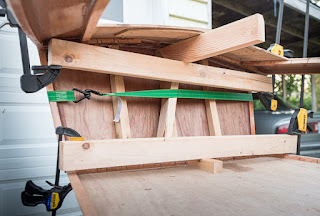 Alternatively, a cargo strap with a ratcheting connection can also be used, again with lumber in the middle of the plywood at 90 degrees to the run of the strap. 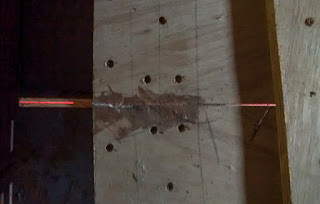 The depth of the lumber need not be as precise because the amount of curve is determined by the tightness of the strap. In the process of turning my hunks of plywood into something that is starting to look like a boat, I wanted do my best to align the major parts: keel and stem, hull bottom, deck. The keel was already on the cart, so I set the front end of the hull bottom into the notch in the stem where it goes. 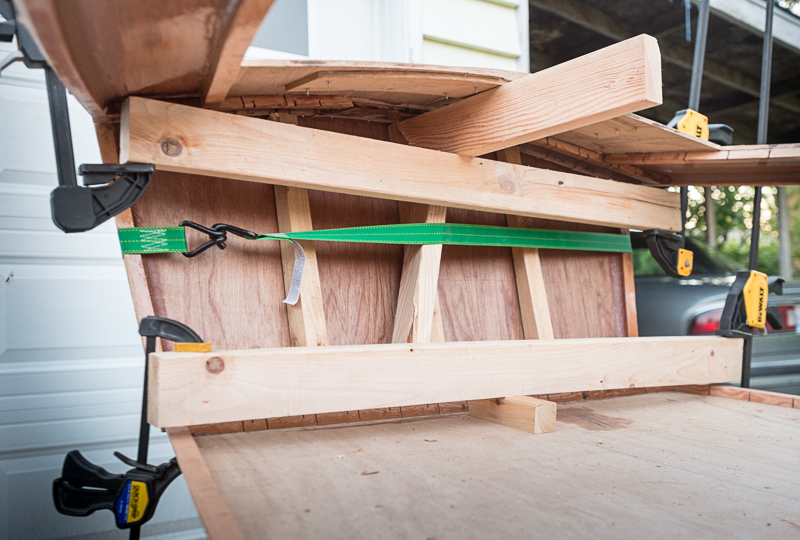 Then I suspended the deck from the garage rafters, positioning the cart beneath. 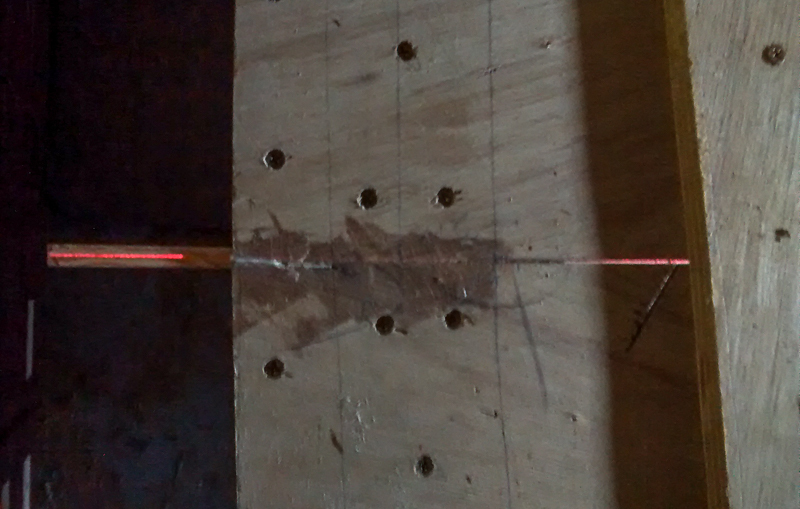 I dug out my (fairly old) laser level and put it to work. 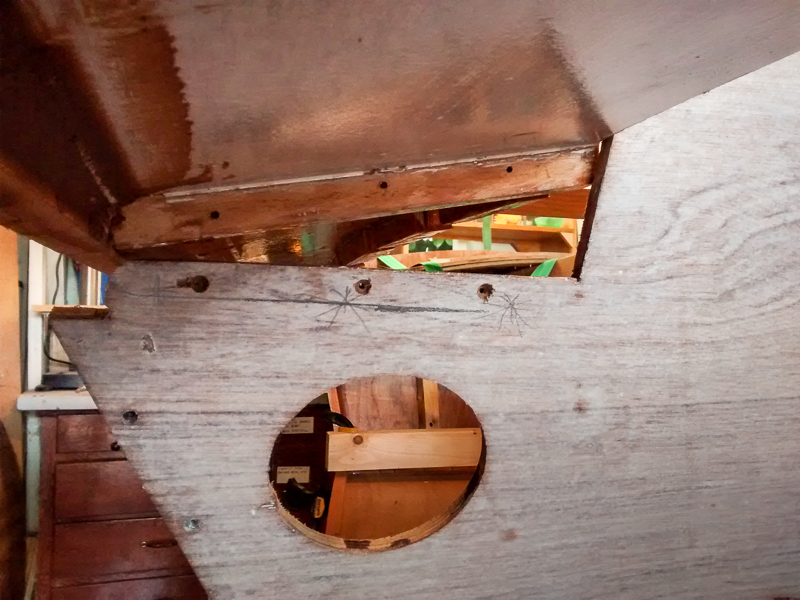 This photo shows that the deck, hull bottom, and center keel lamination are nicely aligned. All screwed together! Now I am discovering where I need to tweak the bulkheads before attaching their stringers, discovering the actual—from life—dimensions of the bow gussets, stuff like that. 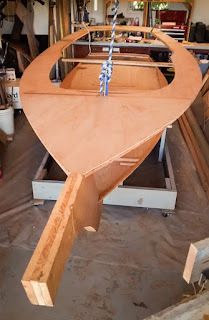 I will be assembling and dry-fitting the mast box next to make sure the foredeck is attached to the stem in the correct place. 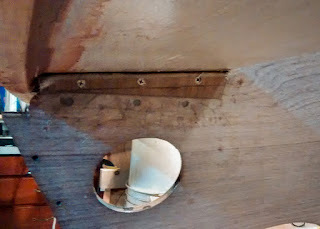 I am coating all my inside wood surfaces with two applications of epoxy. 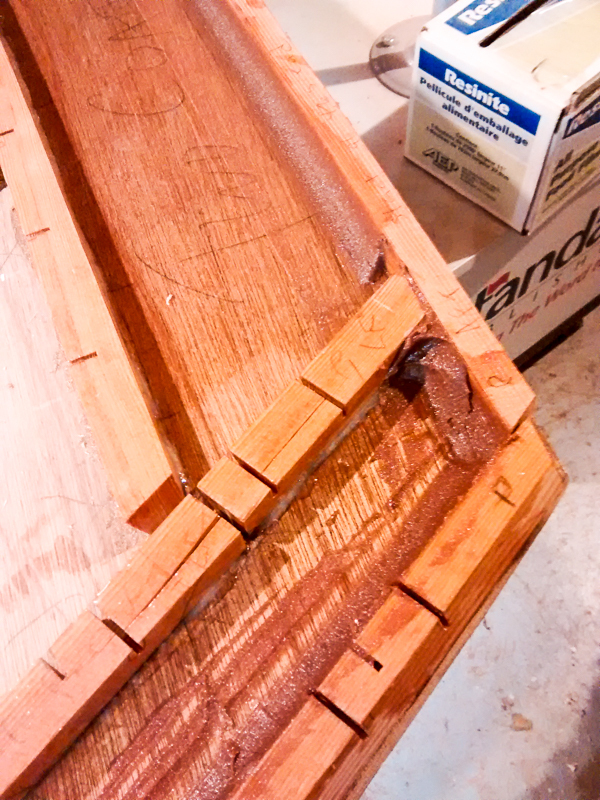 For the top coat in the areas visible inside the cabin, I added white pigment to the resin. 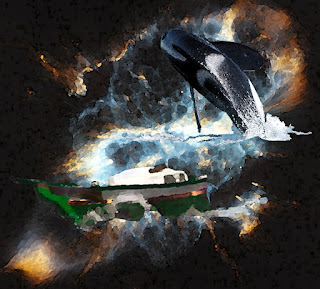 This way, I can comfortably get away without spending the time to paint the interior. 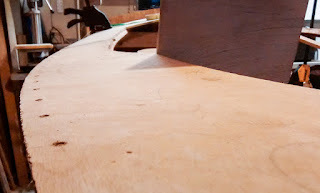 I am adding a fillet to all the stringers along hull seams.